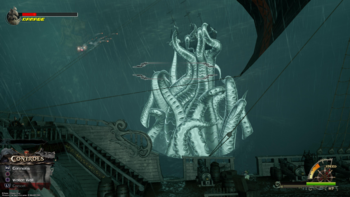 The Kraken is a monstrous being in Kingdom Hearts III. It originated from Disney's Pirates of the Caribbean: Dead Man's Chest. The Kraken first appeared as an antagonist in the 2006 film Pirates of the Caribbean: Dead Man's Chest. It is based on the mythological entity of the same name. In the film, Davy Jones has the power to summon it and use it to attack whatever he commands, due to Davy Jones's power to mark those who owed him debt with a black spot. The Kraken destroys two ships; the first is the Edinburgh Trader which Will Turner is on. It later destroys the Black Pearl, in which it seems to swallow and kill Jack Sparrow, although it took him to Davy Jones' Locker. In the next film, Davy Jones is forced to destroy the Kraken under the orders of Lord Cutler Beckett, who controls his heart. This page was last edited on 18 March 2019, at 19:49.